This quaint, low-key spot has become a local favorite thanks to its consistently fresh sushi and great prices. The sashimi melts in your mouth and the atmosphere is perfect for a casual night out, with huge fish tanks and private booths with sliding screen doors. We recommend trying their famous Whatever Roll, rolled with eel, spicy tuna, avocado and four different kinds of flying fish roe. At this cozy Asian-fusion spot, the focus is on the fresh, innovative seafood pairings. An abundance of colorful, flavorful sushi and a chef’s selection Omakase menu keep guests coming back for more. The Daniela Roll is a favorite amongst diners, made with spicy tuna, crunch and avocado topped with fresh yellowtail, spicy jalapeño slices and tobiko, all topped with yuzu olive oil dressing. Another unexpected menu favorite is the Arata Vegetarian Roll, loaded with seaweed, cucumber, mesclun salad, tomato and avocado, then topped with house made ginger dressing. Spicy tuna pizza is one of the fastest growing trends for sushi lovers, and Xaga's version certainly doesn't disappoint. The texture has just the right amount of crunchiness drizzled with creamy spicy mayo. And the spicy tuna is some of the best around. Order it as an appetizer for sharing or indulge in your own sushi pizza during lunch. f you’re looking to try one of their more unique rolls, go for the Louis Roll, a rice less roll decked out with eggplant tempura, spicy tuna, lobster salad with salmon to top. Aside from their impressive steaks, Blackstone also serves off some incredible sashimi and sushi rolls. We recommend splurging for the Blackstone Supreme to experience the best of both worlds. Wagyu beef combined with avocado, spicy tuna, king crab topped with eel sauce, scallions, tobiko and a signature spicy sauce for some added kick. 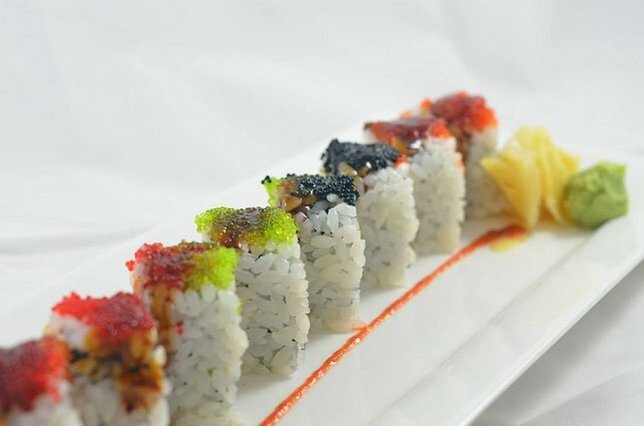 Signature rolls from MOCA are one-of-a-kind. If you like a bit of sweet and spicy, go for their Paradise Roll, spicy snow crab, shrimp tempura stuffed inside a fried banana and wrapped with soy bean paper. MOCA is conveniently located in a huge shopping center, making it the perfect location to go for a quick bite to eat when you've got a long list of errands ahead of you. Sushi KO in Merrick serves up Japanese entrees in a friendly, contemporary space. Best known for its Omakase sushi—the chef chooses the menu using the freshest seafood available. Specialty rolls like the Surf & Turf (spicy steamed live lobster, cucumber and avocado topped with seared filet mignon and Japanese BBQ sauce) make the menu like no other. Healthier options include low-carb, no-rice, black rice and shirataki noodles are also available. With locations in both Bayshore and Smithtown, AJI 53 is serving up beautiful sushi and modern Japanese cuisine. Start with the Tuna & Chips, fresh tuna, sun dried tomato, guacamole, balsamic truffle, served with wasabi seaweed chips and tortillas. With the “Best of the Best” rolls crafted by Chefs Ken and Leo (founders and owners), Salmon Lovers will go crazy for the Crown Salmon (spicy crunchy king crab, shrimp, cucumber, wrapped in soy bean paper, topped with seared salmon, avocado and truffle wasabi mayo). Subject: LongIsland.com - Your Name sent you Article details of "Seven Long Island Sushi Dishes You Need to Try"